I watched the première of Vikings season 3 'Mercenary' and I liked it. First we see a summary in the mix of season 1 and 2. There is a change of character to begin with. Lagertha goes to the seer to ask him a couple of questions. It is in my opinion not something she wanted to know. Then the seer tells her answers in riddles. One of the riddle is I see a trickster whose weapon cleaves you. By this riddle I needed to watch the full episode to find out what was going on and a couple of possibilities arise. I will name a couple because it is not yet told. So I take you with me into the thoughts and opinions of myself. The first one that came into my mind was Floki as trickster god Loki this was before I saw this episode but he is not the only one who could trick Lagertha. King Eckbert is the second one he likes her but what is the profit he could cleave out of this. The bond between Ragnar and herself. Or could it be Kalf she want to marry but he thinks it is not a good idea the people of Hedeby could think he would do it for the ambition. Ainar could be the one who will because when Lagertha is gone he want to betrayal or murder her, he wants the old dynasty back. Last but not least The Wanderer not yet been seen in this episode could be one who trick her into something. Over to Ragnar and Bjorn where I first thought they would be raiding Iceland and where there on a top of a mountain. But it was the top nearby Kattegat the one Ragnar fell off in season 1 while escaping Earl Haraldson. Where you could see the city. Here are a father and a grown up son talking about Wessex and raids. Power is completely explained by Ragnar to Bjorn because that is what Bjorn sees. One thing I don't understand is how Thorsten and Rollo came to the point from dead through back alive a short back story. Then we have lots of difficult relationships from the start. Lagertha and Kalf (ambition), Ragnar and Auslaug (Ivar and Auslaug herself), Bjorn and Porunn (Bjorn want to protect Porunn, Porunn wants to raid with him), Floki and Helga (too happy family and their child and Helga gives him a trapped feeling), Rollo and Siggi (I don't know but there like a distance away I think because of what she did with King Horik and his son). The relationship between Ragnar and Athelstan explained as equal but where Athelstan goes from Christian to Pagan gods Ragnar reverse the gods. 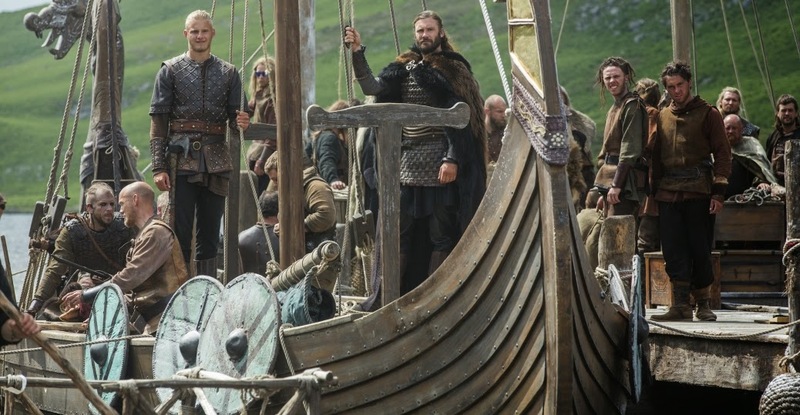 On the boats it looks like the opinion Rollo has changed in the benefit of Floki. They tell a story together. When they meet each other before the boat set sail to Wessex they are clearly glad to see each other. Could we say after the Wessex battle that someone is becoming King? I am not so sure but we will see what happen. I like the filming technic used for the battle in Wessex. They filmed from the water to the land even a bit under water. What I also like is the new hair, tattoos, clothing and jewelery and the new old languages used. (English, Scandinavian). I don't know what kind of relationships will become from Lagertha and King Eckbert, Athelstan and the Princess and Kwindreth and Ragnar. I do hope to see some development on that part. Don't you think Brithwolf is looking a lot like King Ealla? I will write as soon as possible every week every episode.